Centered within is the 10 ½ foot sculptured bronze sphere representing the Universe as man has imagined it. Its design contains symbols of Eternal Life and Spirit derived from ancient myths. The bronze central figure towers 43 feet above the basin. This figure expresses the main theme of the Fountain: the spirit of mankind rising out of the flames of war and the destructive elements of life, reaching and ascending to a new understanding of life. The Fountain took nineteen years to complete and is located at the Civic Center Mall A in Cleveland, Ohio. 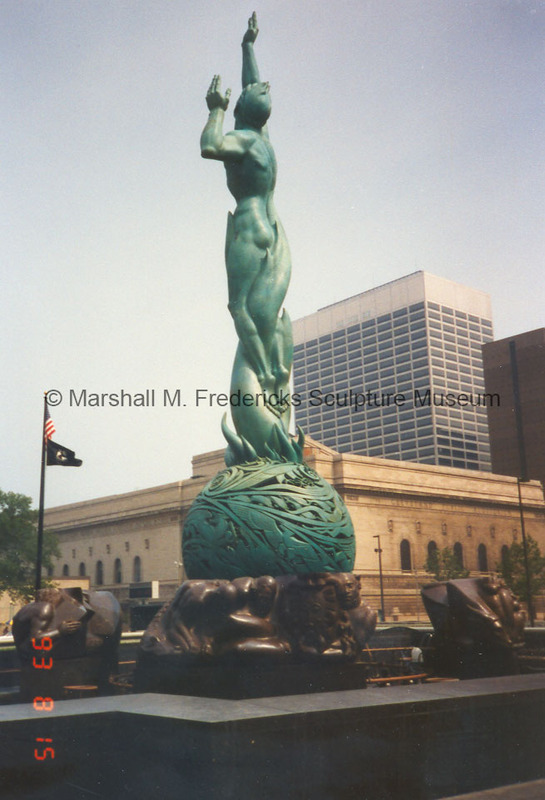 “Rear/side view of the "Cleveland War Memorial: Fountain of Eternal Life" - 1993,” Marshall M. Fredericks Sculpture Museum, accessed April 19, 2019, http://omeka.svsu.edu/items/show/1049.